More data is available than any point in history and often a simple graph can go a long way in presenting complex relationships between data elements. 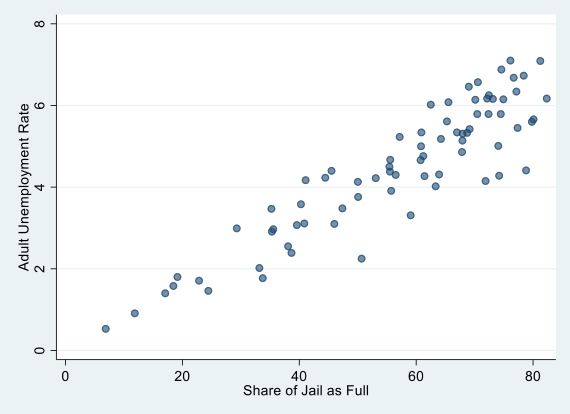 Stata offers an impressive set of options to create graphs. In the following post, we look at three features in graphics. 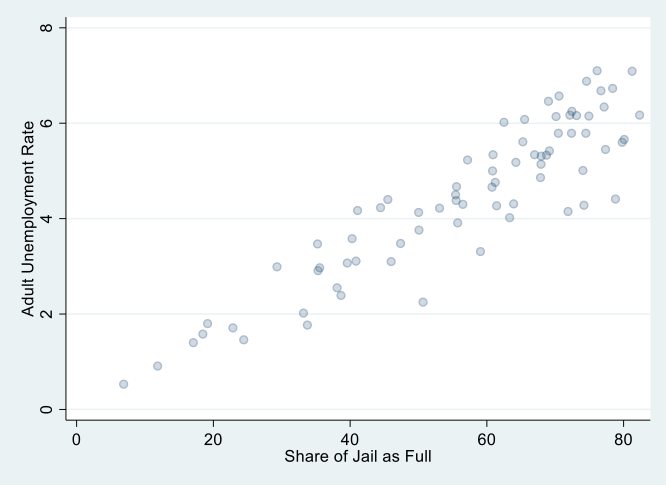 The first one is the new transparency feature in Stata 15. The second and third are user created commands. Stata 15 introduces a new feature that allows the user to make Stata graph’s elements to be transparent rather than just opaque. 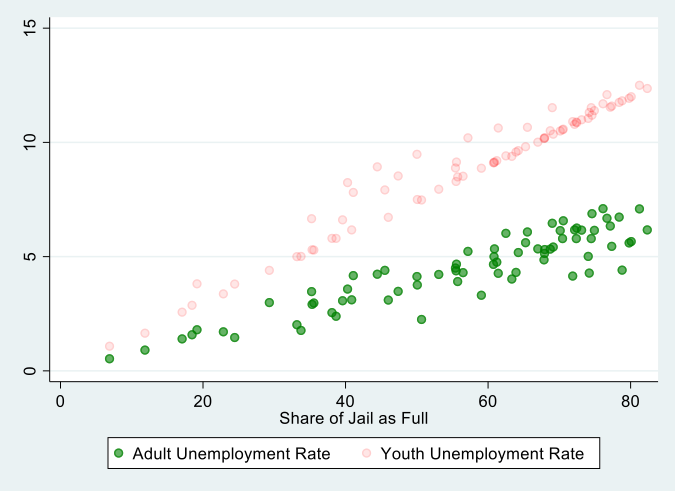 Using the city_data file let us draw a simple scatter plot that shows the relationship between the share of jail being full and the adult unemployment rate across 75 cities (Note: the data is fictitious and was created for illustrative purposes only). The above graph shows the dot as dark. We now add the option ,mcolor(%60) to show the new transparency feature. We can change the colors and how transparent are the dots. Let us try: ,mcolor(%20) to show the new transparency feature. This gives us a completely different look using the same command but under a different scheme. This command presents coefficients from regressions in a graphic rather than as numbers in a table. This type of coefficient presentation is gaining interest among researchers and is often easier to show during presentations. 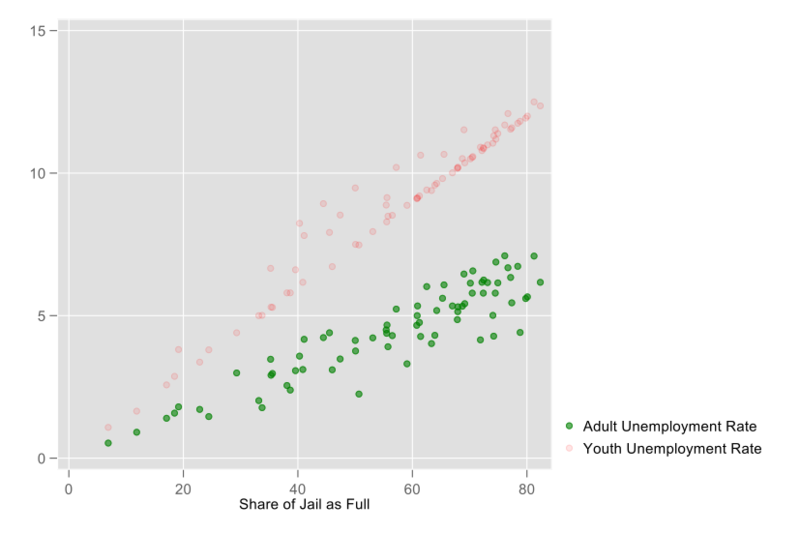 The white dot reflects the coefficient and the black bar is the 95% confidence interval so one could easily see that the coefficient on level of violence is actually around 0.4 and statistically significant for working full time while it is negative and also statistically significant under working part time. The keep() allows us to choose which covariates we want to show on the graph; the coeflabels() allows us to label these covariates; the other options help us design the graph so feel free to experiment with these to build your own design.